It was ‘back to school’ time during the alumni meet held on Nov 17 at St. Anthony’s Girls School, as nearly 500 old students from various batches got together for an evening of fun and nostalgia. Many were clearly thrilled to be back on campus, as they visited their old classrooms and tried to recognize their teachers and classmates. The chief guest for the day was Dr. Selvi Radhakrishna – an oncoplastic surgeon – who belonged to the 1984 batch. She fondly recalled how the school and the teachers had been a source of inspiration, and she urged all alumnae to think about giving back to their alma mater. Rev. Sr, Jackuline, the Headmistress, expressed her joy and listed the various needs of the school. The correspondent, Rev. Sr. Antonyammal, presided over the gathering. Among the guests of honour were Hema John – the Tamil gospel singer – who also sang the prayer song, Shobana Ravi – a popular news anchor at Doordarshan Chennai in the 1980s, Dr. N. Vasugi Raaja – the dean faculty of home science at Avinashilingam University in Coimbatore and Rani N Lakkumi Kumaran Sethupathy – the Rani of Ramnad. 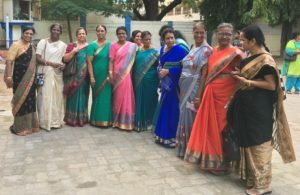 While Hema John recollected how the school had been a source of sustenance through difficult times, and had shaped her singing career, Shobana Ravi expressed her happiness at meeting her classmates from the 1970 batch, which also happened to be the school’s first English medium class! The alumni meet was webcast live through the School’s Facebook Page, and was watched by alumni across the world. Seen in the picture are the teachers who attended the meet. This entry was posted on Wednesday, November 28th, 2018 and is filed under Community, Schools. You can follow any responses to this entry through the RSS 2.0 feed. You can skip to the end and leave a response. Pinging is currently not allowed.